The Black Pearl is my contender for amusing garnish of the year. (That orange Mohawk on the Handsome Devil is good competition, though.) 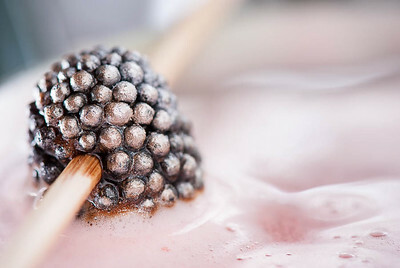 The “Black Pearl” is a silver- or pearl-dust coated Haribo blackberry or black raspberry candy, skewered and skimming the foam atop the cocktail glass. Add all liquid ingredients but sparkling wine to a shaker, and shake 6–7 seconds; add ice and shake vigorously another 5 seconds. 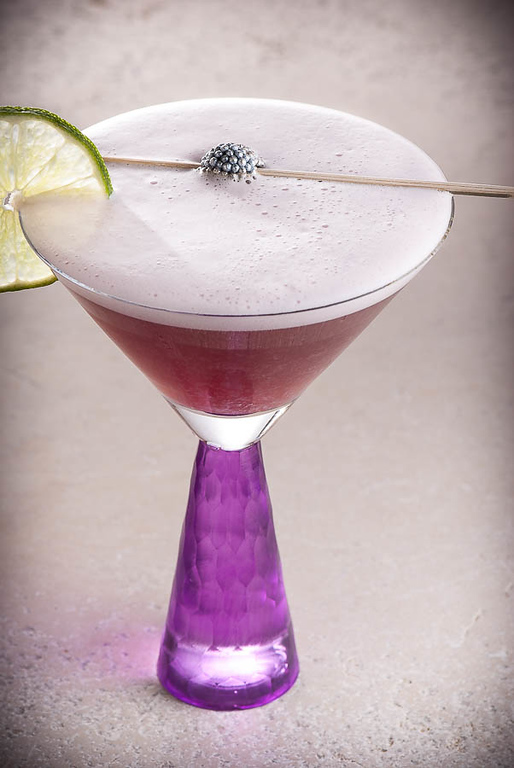 Strain into a chilled cocktail stem and top with sparkling wine. Mount key lime on rim, and place skewered candy across the top of the glass. The Black Pearl garnish is simple to make. The Haribo candies are a sort of gum candy, like gummi-bears, only shaped like fruit. I don’t know how widely they’re distributed, but they seem to be easily available in my groceries. The pearl coating is “Luster Dust,” which you should be able to find in good kitchen or baking stores. Dampen the candies—barely—with some gin or vodka. (As Michaels says, “Try not to soak them, because doing so increases the likelihood of jet-black candy dye…staining your shirt.”) Shake a bit of the dust over them, tumbling them a bit, until the coating suits you. Set them aside for awhile to dry. You can store them in a covered jar to keep them from humidity. While we’re on the topic of garnish, the recipe calls for a round of key lime. Those wee limes are elegant, if you can get them. Regular limes will do nicely. Michaels prefers Cava for his sparkling wine. It’s easier to find a decent champagne or California sparkling wine, which work well. You don’t want to overdo with the wine—just enough to fizz up the drink is all you’re looking for. The Black Pearl is a light, sweet and very attractive charmer. It is, I think, just the champagne companion for a New Year’s Eve. “Vodka and Champagne: the Black Pearl Cocktail” at cold-glass.com : All text and photos © 2013 Douglas M. Ford. All rights reserved. Sounds delicious. Have you ever tried a champagne and guinness cocktail? That’s a really curious combination, rich and refreshing all at once. Champagne and Guinness. Yes, that’s curious—never tried it. Rich and refreshing is an intriguing description. Thanks for the idea. What a fantastic cocktail, I am very impressed! Thanks for this post. It’s a good one. Thanks for taking time to comment. The cocktail sounds fantastic, and I’m always happy to see things that are commonly used as cake or pastry decorations (ie. luster dust) used in different ways. I’m now thinking of all of the gummy candies I should be painting to look like metal.